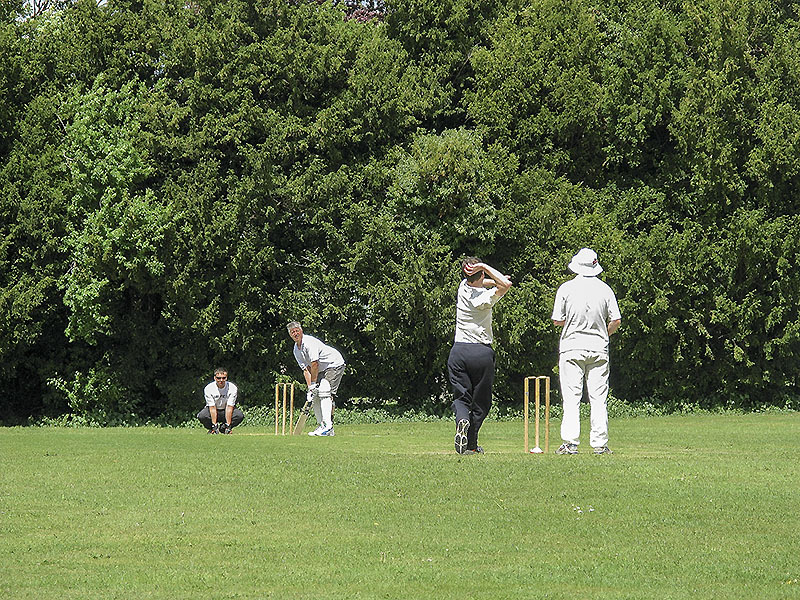 Cricket in Whaddon was revived in 2011. The team continues to enjoy the same reputation it had then... Have a look at the stunning stats in the tabs below. 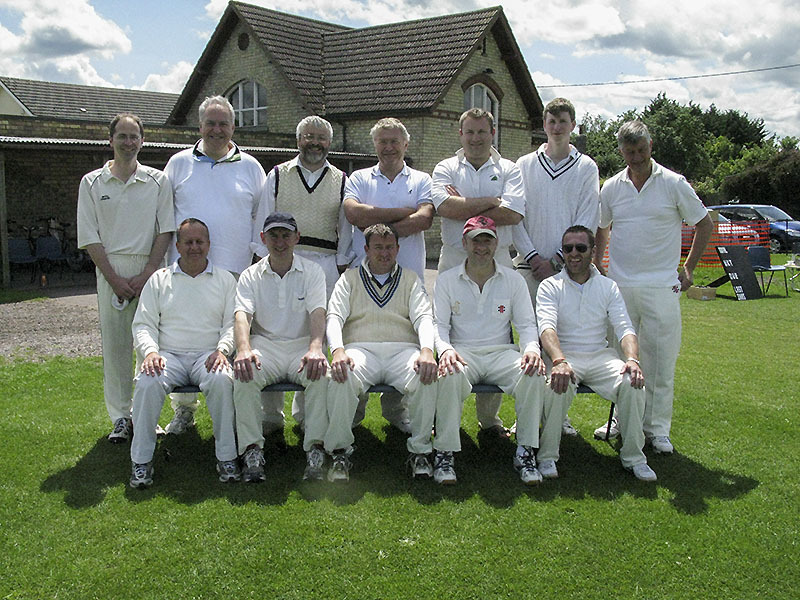 Sunday 8 May 2011: The first cricket match was played on the Recreation Ground in Whaddon for many years — no-one can quite recall when cricket was played last. 18 men from the village took part, divided into two teams, in an intra-village game. 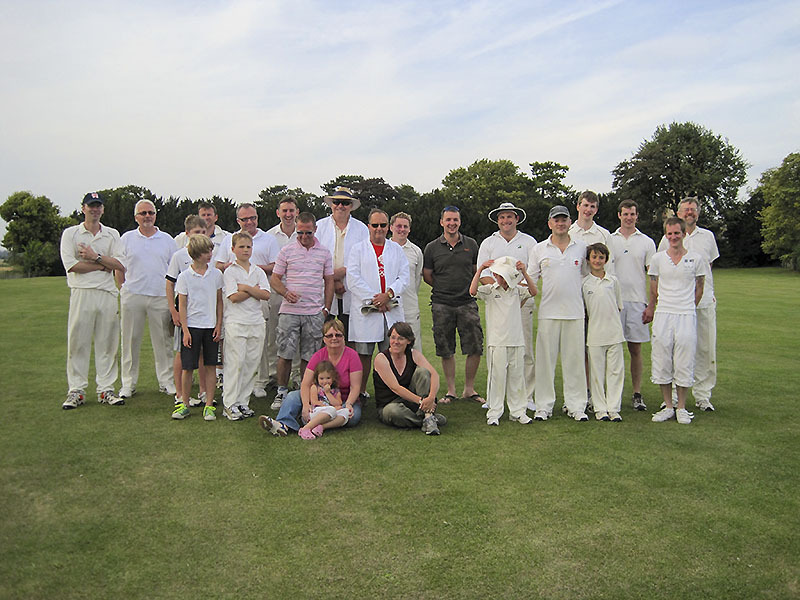 2011 saw a total of three proper matches, of which Whaddon won 1 and lost 2. The club moved from strength to strength in 2012. Ten matches were played, 4 won, 5 lost and 1 drawn. Peter Haselden has prepared detailed statistics of the team's performance and these are in the Scores 2012 tab below. Late 2012 saw good news for the club. 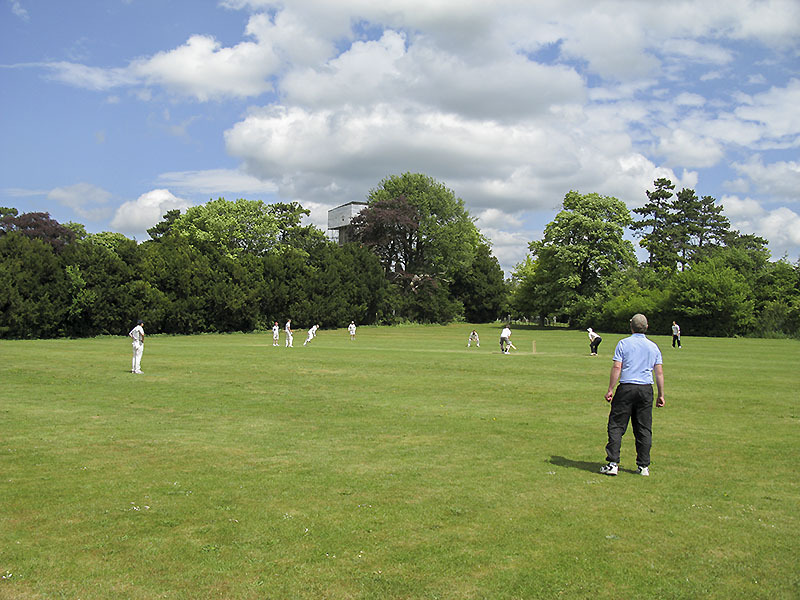 The Parish Council awarded some funds which came to the village from the Section 106 agreement relating to the development of St Mary's Close for cricket, and so in 2013 it will be possible for the village to have some cricket nets in which to practice, plus a repaired roller and various other improvements for the club square and equipment. We thank the PC for this. Summer truly arrived in Whaddon today. A scorching day in the middle where BBC Weather's claim of 25 degrees felt at least 10 degrees too little. Hare St. Won the toss and decided to have a bat. Despite the heat, WCC started very tidily, Peter H and Bob keeping it at 3.5 an over for the first 6 and Peter removing Fitzgerald senior cheaply. Tom N bowled with real zip and looked threatening, particularly with his quicker stuff and was unlucky not to get his name in the wickets column. He also took a stunner of a catch to remove Fitzgerald junior off Steve C's second over, a wicket maiden! Another bowling mention must go to our debutant Michael B who showed some fantastic turn and bounce with his leg breaks. Again hugely unlucky not to get in the wickets column after creating numerous chances. We look forward to him playing more matches in the future. Mark G though was the pick of the bunch, getting the key wicket of Ward (who almost always has scored a 50 against us in previous years) and adding Figg lbw. He also delivered the throw for the McNamara run out. He finished with 3 overs, 5 for 2. Hare Street have quality and depth though, and Newland and Scott Caine both batted well to keep the score ticking along. But our bowlers did a really great job holding them to 154 for 5 from 30 overs. It only seemed to get hotter as WCC went out to reply, Mark G getting the nod after his great anchor role last match v Sandon. Steve C was unlucky to get one that ripped off the pitch. William H was looking very good with a couple of excellent wristy boundaries before slightly mistiming one and paying the price. Tom N played a little early on one that sat up for a well taken c&b, and Michael B was unfortunate to pick out a fielder taking us to 34 for 4. Bob S and Mark G batted well and kept us in the hunt and the latter was very unlucky to fall to a fine C&B after a cracking 42, the Whaddon knock of the day. A rush of Welsh blood saw the end of the skipper very soon after for 39, flashing at a straight one. Shot of the day came next via RVPs cover drive for 4. Straight out of the text books. He finished unbeaten on 15. Unfortunately though with Caine at one end bowling really well and Ward at the other keeping it very tight, we were always slightly behind the rate. We finished 15 short, but it was the closest we have come to beating them. Roger H carried his bat to remain the only Whaddon player yet to be out this season. A few good performances, but only one real contender for Man of the Match, Mark Green for both bat and ball. Well done to him, a great all round performance. Many thanks from all of us to Mark N for all of his tireless work on the pitch without which we wouldn't play at all, and to Karen for tallying all day for us in the heat. The McColl’s convenience store in Royston has donated a fantastic £250 to a local cricket team in Whaddon which they plan to use to purchase new equipment. The store on Queens Road Royston raised the money through the Making a Difference locally charity, where customers purchase specific products in store and a percentage of the money goes into a virtual fund for the retailer and shoppers to choose a local charity to donate to. 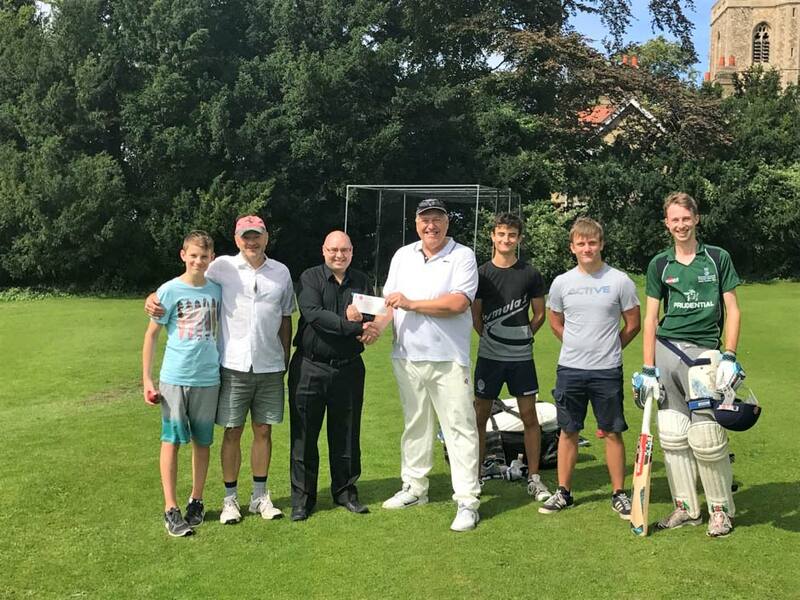 James Coningsby of McColl’s is seen handing the cheque to WCC Vice Captain Mark Newberry and other members of the team during a practice session. Mark said “we are only a small village club that plays a series of friendlies each year, and this money makes a significant difference, as it will go directly towards equipping junior players and local youngsters wanting to try the game”. 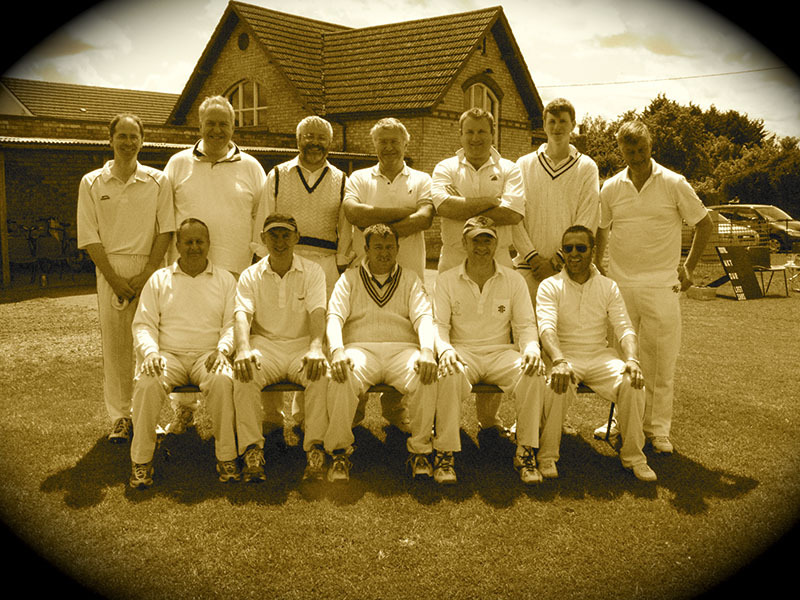 This year Whaddon’s season started in January with a successful run of indoor nets up at Burloes farm. New and old faces alike have all made a real effort to attend, and together we have been honing our skills for the summer. On top of the players’ practice, there has been a huge amount going on behind the scenes too. This year we have lost our groundsman and so all the hard preparatory work for the season has come from within the village. There has been much to do. The cutting back of the thicket at the golf centre boundary, the removal of the grass from the outfield, the purchase and mastery of the new mower, and the restoration and use of the old roller. A huge thank-you to everyone that helped out. 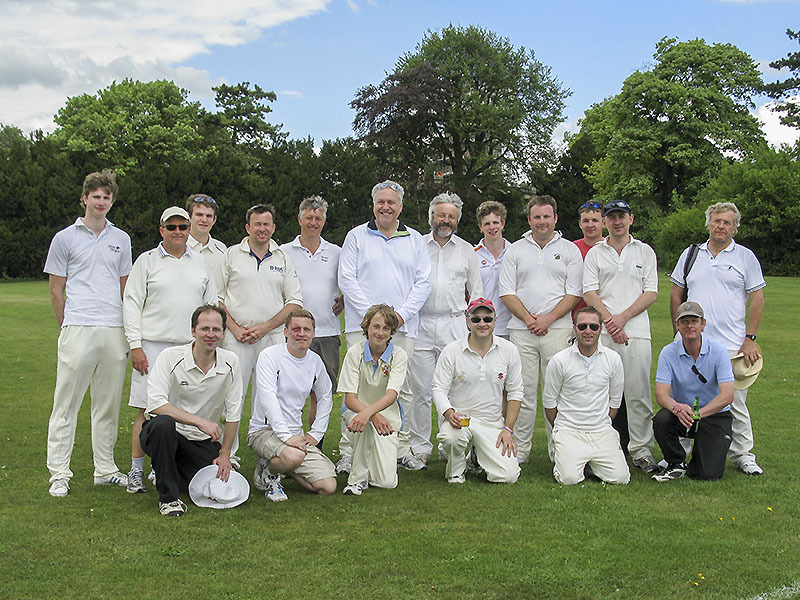 Particular thanks to Roger Huffer, Richard Green and the boys and Mark Newberry for being instrumental in getting those jobs done, and ensuring cricket is alive and kicking in Whaddon for another year! So… All the prep work? Done. All the practice? Done. How would new-look Whaddon 1st X1 fare in the first match of the season? St. George’s Day 2017. A glorious day more suited to mid-June than to late April. Hardly a wisp of cloud in the azure sky. The square was looking fantastic. The stage was set. We awaited the arrival of the old foe, Sandon Strollers. Bob Strawbridge had been given the nod to skipper, and winning his first toss, elected to put the visitors in. Whaddon took to the field, and opted for an opening pair with youth on their side in the form of Edward Haselden and Mark Green. It was a great combination. Both young men have come on hugely in just 12 months. Edward bowled aggressively with real pace and bounce from the pavilion end, (which on such an early season wicket is no mean feat!) beating the bat on so many occasions he deserved to pick up a few. It’s always good to get the oppo hopping around a bit at the start – he did a fine job of unnerving them. Mark G at the Vicarage End showed how crucial nets can be in improving line and length. He bowled straight and true in this early spell, and was rewarded in only his 2nd over with the first wicket, Roper LBW for 0. His following over he picked up the crucial wicket of opener Singh (who had knocked 50 against us at our last meeting), Frank Huffer snaffling the sharp chance behind the sticks. 22 for 2 from 6. 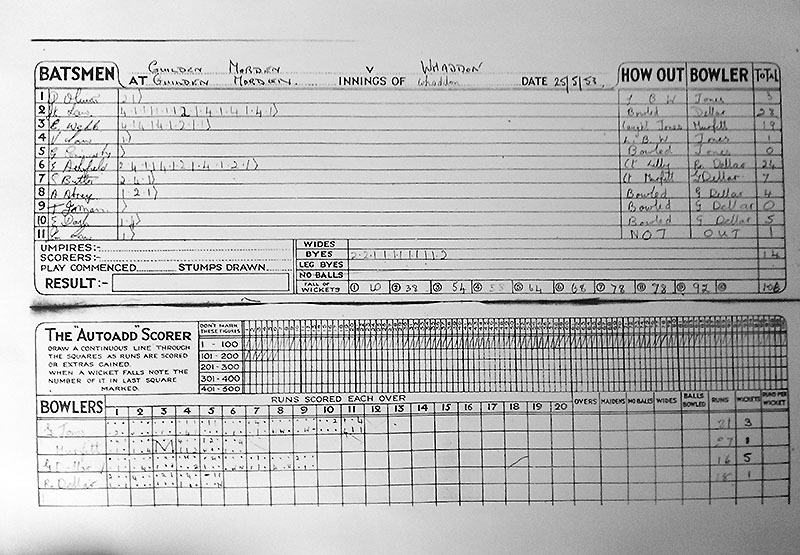 Youth gave way to experience then with Peter Haselden entering the fray at the Vicarage End and getting amongst the wickets with his very first delivery. A mistimed lofted drive and Bob made up some good ground to take the catch in the deep. This wicket started what was to be a really cracking spell. His next over saw another wicket – Hughes, clean bowled for 11 and Sandon were 37 for 4 from 10. Things were looking good for Whaddon. Over 12 saw Peter taking his tally to 4, bowling Kay for 5 and then knocking Bandy’s stumps over with a superb in-swinging Yorker for just 8. Despite it being very much a seamers day, Roger Huffer was the pick of the slow bowlers. His very tidy 6 for 1 from 3 overs built good pressure and his wicket was a very satisfying all family affair. A typically teasing Huffer delivery, given plenty of flight, lured the batsman into an ill-advised charge and son Frank whipped the bails off. Roper.T stumped for 3. Things were looking fantastic for the hosts. Strollers were on the ropes at 53 for 7. It was starting to feel that nets had paid off and belief was filling the hearts and minds of the fielding side. Just one or two more jabs and the knockout blow and we’d have skittled them for fewer than 70. But cricket is never that straight forward. It’s why we all love it so much. Just when you think you’ve got it in the bag, Old Father Time steps in shakes things up again. Bats 8 and 9 bought together the Strollers’ old guard of Inman and Fisher. 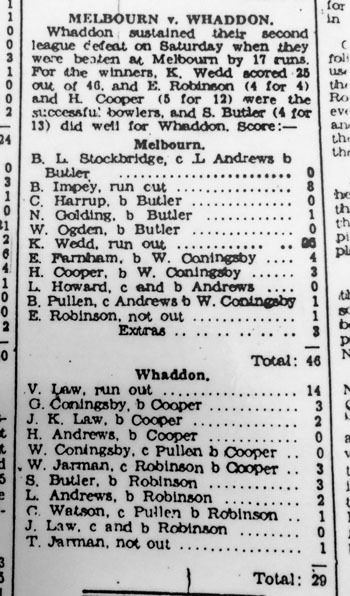 And so began a period of frustration for Whaddon, as they set about repairing their ravaged innings, with two patient and predominantly chance-free knocks. It got tougher in the field for Whaddon as we started to take on runs. Our bright start was starting to slip away as despite lots of tactical bowling changes, we just could seem to break the partnership. Some good fielding performances did help stem the flow somewhat, particularly debutant Jonathan B doing great work on the boundary. Steve C also deserves a mention for stopping one of the hardest cut shots I have ever seen with his shoulder! It sounded like a gunshot… Despite our efforts though, both batsmen went on to score 50s and it changed the complexion of the game immensely. We didn’t get to bowl at a new face until strollers were 154 with only 5 overs remaining, and their tail just wouldn’t stop wagging! 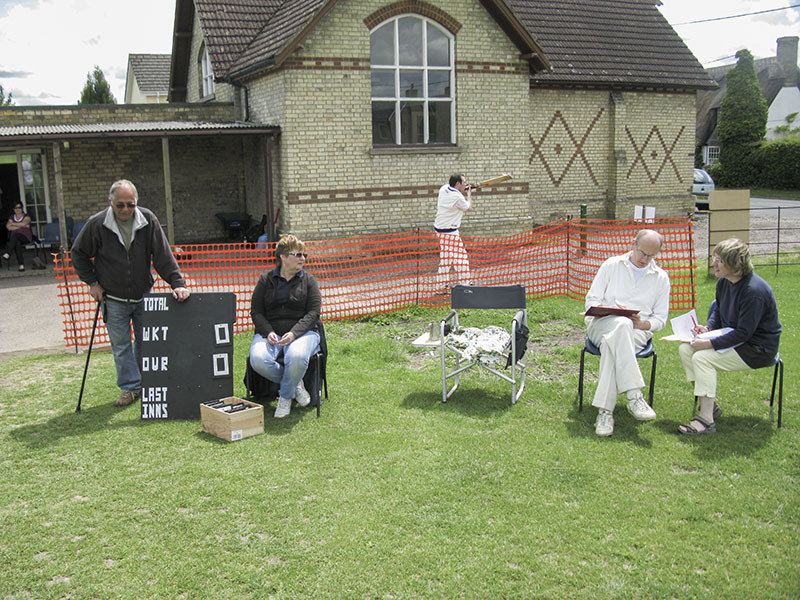 There was time though for 3 Whaddon “firsts” in the last few overs. Mark N took his first ever catch – a good sharp chance at point bringing Peter his first ever Michelle. And to round things off, an exceptional piece of fielding by Mark G to run out Heath in the final over from a laser accurate throw to the top of the stumps. Sometimes in life we all need a little boost when things seem bleak. When things feel hopeless we need a little something to remind us there is still hope. On this day it came in the form of cake. Ginger cake no less, incredibly moist and a thing of true greatness. Many thanks to John Newberry for his skill and morale boosting syrupy goodness. If Whaddon ever does to a cake bake-off, I’m on his side. Emboldened and happy for having tea, Bob grappled with the first batting order of the year. This time Whaddon went for a mature start, with the left hand / right hand combination of Roger VP and Nick Lewis. Strollers had set us a run rate of 5.22 per over. So we had our work cut out for us. They started in a lively manner, 13 runs off the first three overs, with one particularly cracking off drive from Nick racing its way to the ropes. The following over however Nick was done to a well held catch at full stretch, and we were 1 down. 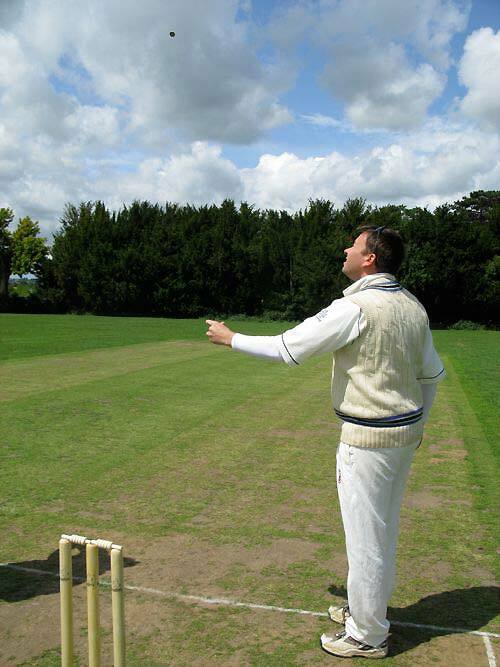 Mark N was playing himself in nicely when he was bowled to a terrible grass cutter bouncing twice down the track. The laws state that to be a no-ball the ball needs to bounce 3 times before the crease, so unluckily for him and us, he had to go. 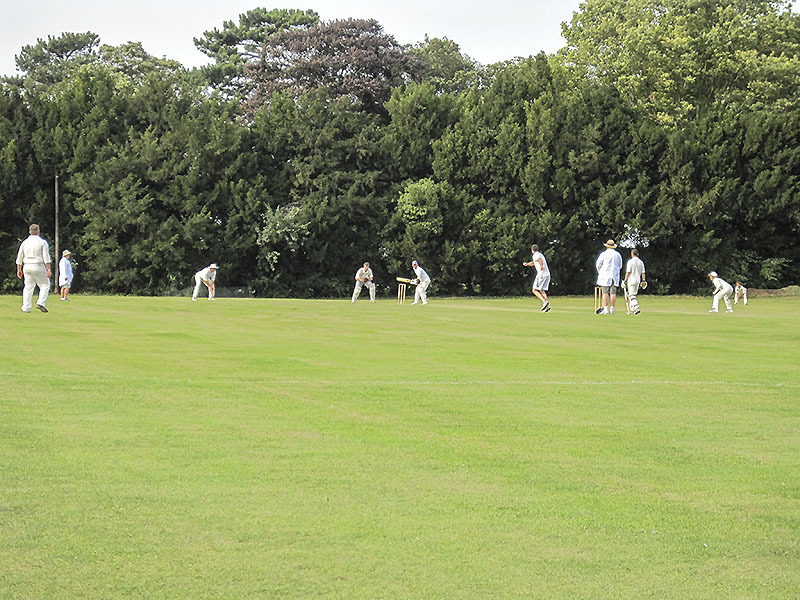 Both Edward and William Haselden were dispatched to good deliveries without really getting started, and things were looking pretty dire for the home side at 37 for 4 from 11 overs. But now it was Whaddon’s turn to dig in, and Frank joined RVP at the crease and did just that. Both punished the bad ball and kept their running between the wickets tight and positive. 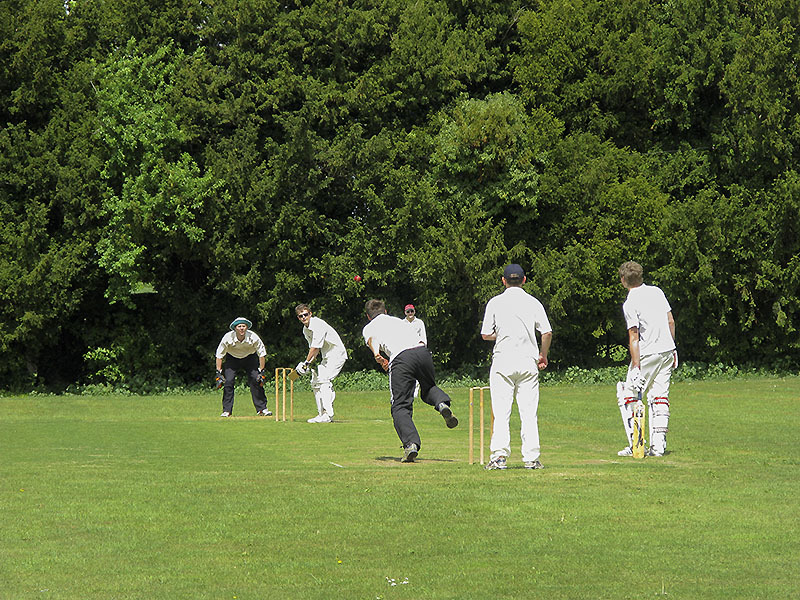 Frank hit some great boundaries in one of his best innings for Whaddon to date. 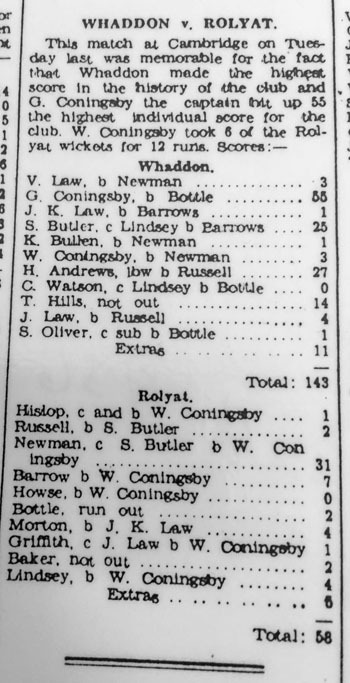 The pair brought the 100 up in the 22nd over, but the RRR was creeping up to 6.3, a combination of a slow outfield and canny field placing by the oppo skipper was taking its toll. Looking to push the pace RVP holed out in the following over for a very respectable 37. Peter stepped up to the plate to join Frank and to keep pushing the pace, but it was proving to be an uphill battle against a steep run rate. With nearly all the field pushed back to the fence it was tough going making ground with singles. Frank proved to be too good for the Strollers’ attack and brought his 50 up from just 60 balls in what was to be Whaddon’s innings of the day, retiring unbeaten in the 27th over. We wished we could have kept him in for longer. Bob took his place with the game in the balance – 124 for 5 from 27 overs. Whaddon needed 64 from the last 9 overs at a RRR of 7.1. The next 30 minutes was exciting cricket – nip and tuck. Both batsmen taking risks to keep the run rate up, and the bowling side were starting to get concerned. Was the tide starting to turn again? Overs 31 and 32 were key for Whaddon with 10 coming from each. An agricultural maximum from Bob. cleared the ropes of the golf centre boundary. 24 balls left, 30 needed. The next few overs were tense, scrappy affairs – top edges, running everything and the occasional boundary was like gold dust. Another good over for the home side in the penultimate (13 coming from it) left the game on a knife edge. 6 balls remaining, 3 runs to win… After 5 hours of cricket, it had come down to this. Sandon threw the cherry back to Hughes to do the honours for the last over – right arm round coming between to the left hander. There was a hush around the ground and even in the middle. You could hear the creak of pads and gloves, even distant birdsong in the early spring evening. Next in was a thrilled Roger H and after exchanging some kind words of thanks with the departing skip, he took his place at the bowlers end as the batmen had crossed. Next ball yielded a single, and the next another scampered between the sticks…The match was tied – 187 apiece with 2 balls remaining. The penultimate delivery left controversy hanging in the air. The ball rapped Peter square on the pads the whole fielding side went up in unison for the loudest LBW appeal heard to date at Whaddon CC. They were adamant they had their man but the umpire was shaking his head. Through all this commotion and waving of arms and the raising of voices, Roger H and Peter took the final run and took Whaddon over the line to a quite remarkable victory. We had done it. Chased down 188 for the loss of only 6 wickets. A truly fantastic achievement. There were some great performances too. Edward and Mark G with the ball. RVP back to form with the bat. The two that standout however are Frank and Peter. Frank had superb day – unbeaten with the bat, a catch, a stumping and only 3 byes in the whole innings – on most days a sure fire MOTM award winner. (Don’t go back to Swansea Frank… Bloody Wales.) But it has to be Peter who receives the opening game’s Man of the Match award for a cracking all round performance. What a great start. Thank you to everyone for their help and continued support too. Helen for scoring, Karen for running the scoreboard, the Newberrys for a great tea, and did I mention John’s Ginger cake? So it’s true. I love cricket. There is only one thing in the world I love more than cricket, and that is winning at cricket. The beers afterward taste that little bit sweeter…Roll on the next match on May 7th and a chance to make it 2 from 2. Hare St 203-6; Whaddon 173-9. Whaddon lost by 30 runs. 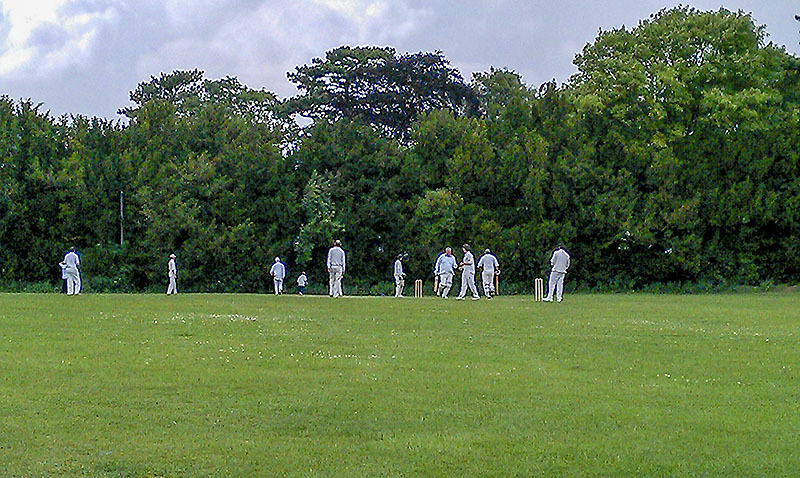 Independent 206-5; Whaddon 197-6. Whaddon lost by 9 runs. This linked PDF file by Peter Haselden gives analysis of the Whaddon scores. Averages from 2011 will also be found. After a successful first meeting on 26th November, we have a total of 26 interested members (list to be added below), and more popping up since then. If there’s anyone else, then please don’t hesitate. each player in a match will be expected to pay match fees (amount to be decided) to cover rental of the Rec and for the provision of crustless cucumber sandwiches, provided by the very generous (a start-up donation was extracted under torture) and inimitable Ken “WG Grace” Green. the cricket pitch will be ready by Spring time (thanks to our trusty professional groundsman Neil Gardner), who has sourced a 1950s steamroller 3-ton for us. It has been brought to our attention that our pitch is perhaps a tad small. It is, there is no denying it. But the “management” (self-appointed at present, sorry) makes no excuse: we feel that the Rec was born for cricket, it is the heart of our village, it will pull them in for miles around once they see us straining every hamstring early of a Sunday morning (after church, of course). I would also direct these people to the Hare Street pitch, which is even narrower. We should see how it goes for a few years, then if we have caused too many broken windows or car accidents (all suitably covered by insurance) we should look for other premises in the village. But for now, let’s go with what we’ve got. One more thing: there is a mole encroaching on the square – any ideas, please let us know. According to the groundsman, he (or she) is after the worms. Please whenever you visit the Rec, take a handful of worms away with you. This will reduce the problem. But please don’t dig for them. This will only make things worse. Sing to them. The Whaddon Whitsun song is ideal (in fact, ancient sources tell us that this was the original reason for its composition). Enough. A church room was built c. 1909 on land given by Viscount Clifden next to the school. By the 1960s it was no longer much used, the school housing most local activities. 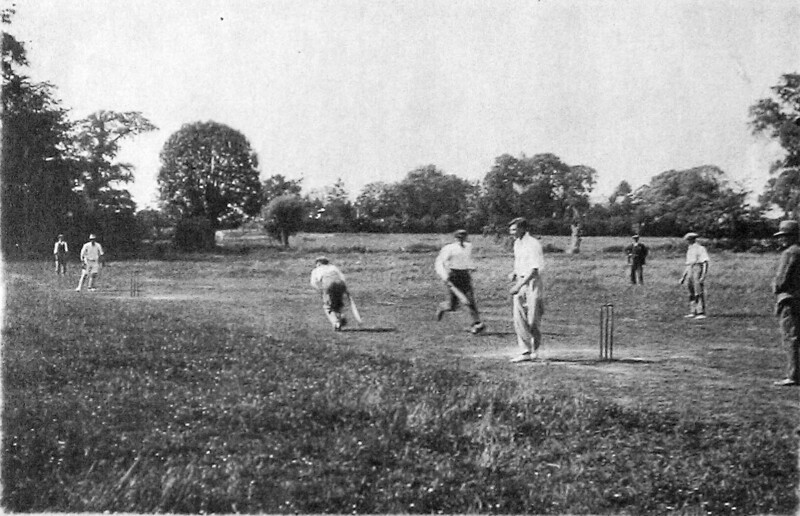 North of the school was a close called the Steel or Stack Yard where the villagers had long played cricket; it was formally bought as a recreation ground c. 1960. ... Mrs A. J. Palmer as a mark of the esteem held for them by the whole village. 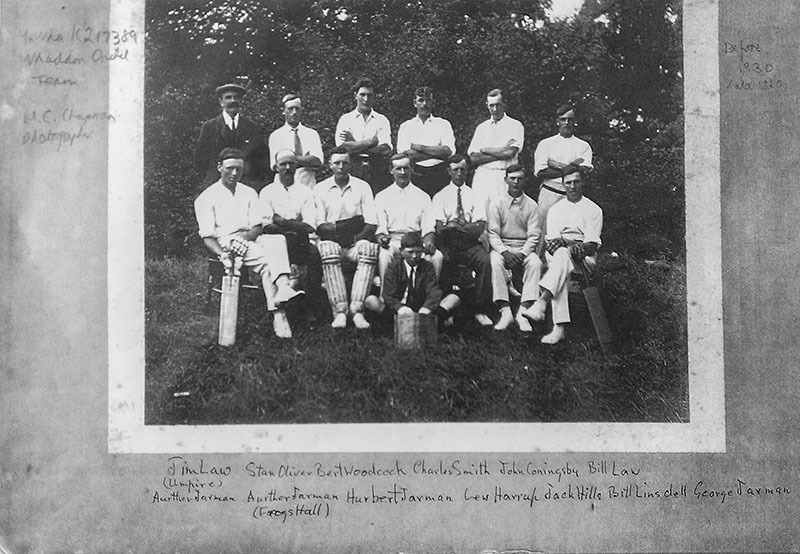 A cricket match between Married and Single was played in the afternoon, the Single winning easily. A string band was provided and dancing freely indulged in after tea. Athletic Sports were arranged by F. Woodcock, T Coningsby and Judd, and there were races also for the women and children. Hearty votes of thanks were accorded to Mr and Mrs Palmer and Mr, and Mrs Coningsby, etc., at the close, and the National Anthem again sung, and a fine display of fireworks was given by Mi. Brockett. The actual date of this is not recorded, but Mrs Palmer died in 1927 so it must pre-date that. 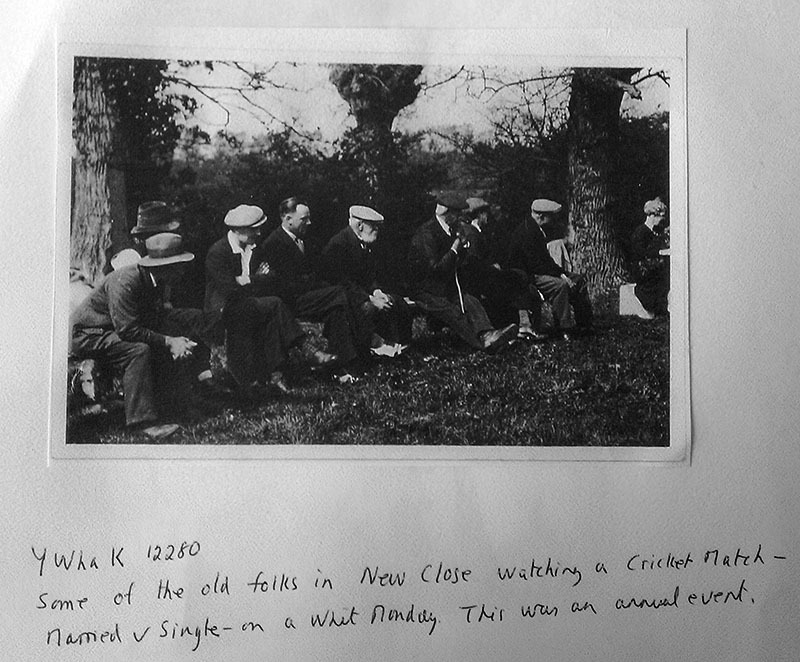 A photocopy of a photo (also courtesy of the Ralls, original now in the Cambridgeshire Collection) shows a group of people watching the same match, and the Ralls note that this took place on Whit Monday. So not only do we have a time in the year for the match, but also further evidence of special goings-on in the village at Whitsun. 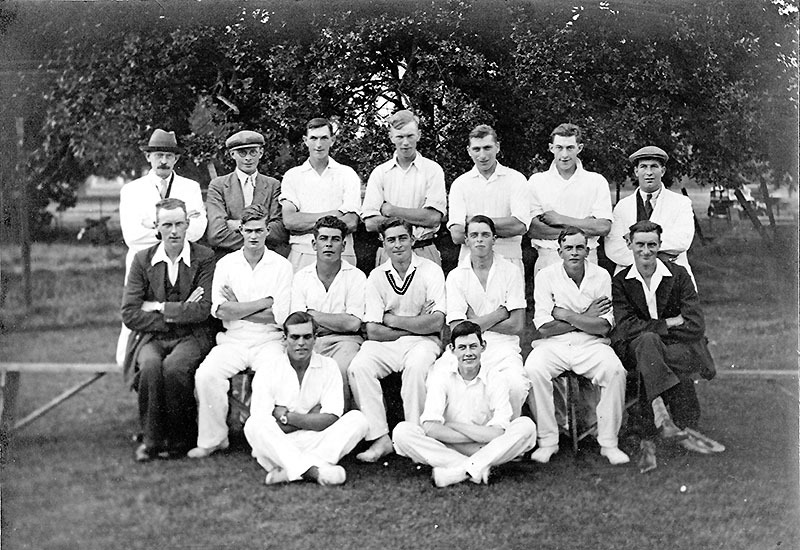 The material amassed by the Ralls covers anything to do with Whaddon; material relevant to cricket also includes lists of fixtures and scores running from the 1930s to (at the moment) the 1950s, as well as club minutes, scoresheets and a few other photos. Some examples will be found below (the photographs were scanned from photocopies of originals now in the Cambridgeshire Collection). As I said, the Ralls' working through the local media has revealed games up to the latter part of the 1950s, although it is not known when they stopped. 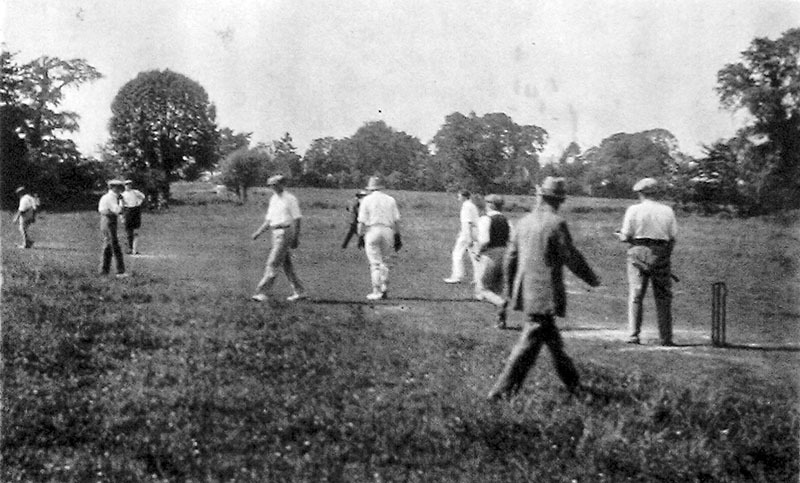 The teams shown above did not play on the current recreation ground, but rather on an adjacent area, now the driving range of Whaddon Golf Centre. 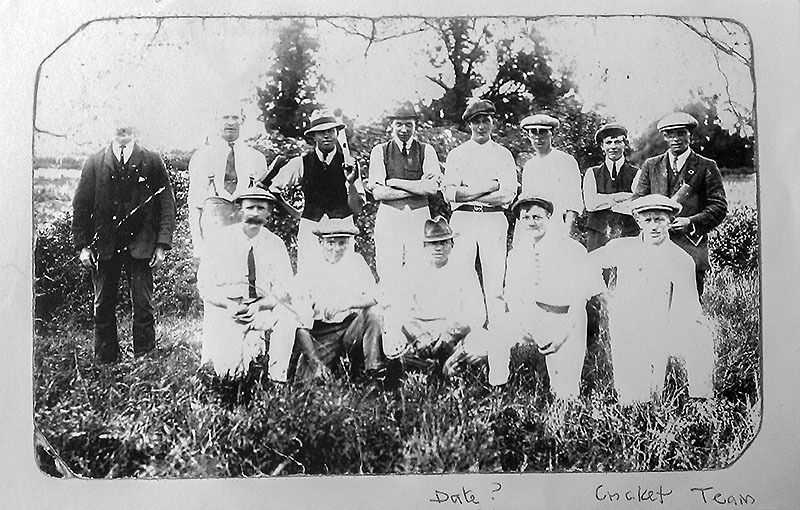 However, when Ken Green, the owner of the golf centre, came to Whaddon in the 1960s to farm at Town Farm, he recalls cricket being played on what is now the Rec. The recreation ground was set up more or less at the same time as the school was closed (in 1962), and the building turned into a village hall. When we were playing at Sandon on 24 July 2016, our attention was drawn to a copy of a newspaper from, we think, the 1930s, with local cricket scores. Here are two photos of entries therein for Whaddon. Rolyat must be a name of a company or team rather than a place — more research is needed.